The NIV Real Life Devotional Bible for Women is a beautiful compact Bible with a sea glass and Caribbean blue embossed leather-like cover and pages etched in silver. Enclosed in a floral designed box, this Bible is a great gift idea. The presentation of this Bible is really gorgeous, and its proportions are purse size. Because of its petite dimensions, however, the print is very small and tightly laid out. 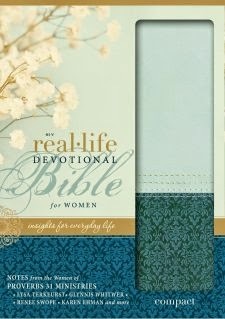 This devotional Bible is edited by Lysa TerKeurst of Proverbs 31 Ministries, with daily devotionals by Lysa and the women of Proverbs 31, including Renee Swope, Glynnis Whitwer, Karen Ehman, Micca Campbell, LeAnn Rice, and more.These devotions are written specifically to women, tackling topics that real women can relate to, such as issues of work, motherhood, relationships, and the responsibilities of busy everyday lives. The 366 devotional readings are numbered, so if you choose to, you can read one a day along with the suggested accompanying verses for an entire year. ". . . He can hold the oceans in the palm of his hand! With a God this big, what could ever escape his attention? What need could we have that he cannot handle? What on earth, above the earth, or under the earth can make us afraid? Certainly, we can place our trust in a God so big that even the waves obey their boundaries (p. 821)." This pretty Bible will entice you to pick it up and delve inside. It is a wonderful resource for life.